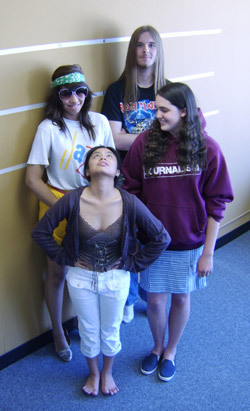 Samantha, center, who is 4 feet 9, poses with friends in front of tape on the wall that marks off 4 feet, 5 feet and 6 feet. Alex Key (left) is 5 feet 7 and Chelsea McNay (right) is 5 feet 8, while Brad Marx is more than 6 feet tall. But as I got older I grew tired of overhearing my relatives say that I would be prettier if I were taller or my mother say that if I wanted to be a successful journalist, it would better if I were taller. My mother, who is 5 feet tall, told me that when I was born she thought I would be taller than her because my dad had the tall gene—he’s 5 feet 7 ½, which is tall for a Filipino. My parents forced me to drink a glass of milk two times a day, until I complained of stomachaches. I used to daydream and believe that someday I was going to be taller than my female cousins, who ranged from 4 feet 10 to 5 feet 5, and my relatives were going to say, “Wow, Samantha you’ve grown!” My daydreams of growing were crushed during eighth grade. I missed a day from school to go to the endocrinologist, who I called the “growth doctor.” I was 4 feet 8 and my mom wanted to know if I was still growing and if I could receive human growth hormone. When injected, human growth hormone can increase height. The doctor jotted down notes about how tall people in my family were, then showed my mom and me a height chart. According to the chart I was below the average height and only about 2.5 percent of people in the world were my height. At first I was excited because that meant there was rarely anyone like me. But then he told me that I likely wasn’t going to grow anymore. And because I had started my period early, I couldn’t have the growth hormone. I held back my tears. During the ride home, I kept thinking “Why me? Why me?” I blamed myself for not finding out about human growth hormone earlier. I complained the rest of the year about my height. I couldn’t help talking about it. I wanted people to say it was OK, it’s not the worst thing on earth and we like you the way you are. Some people comforted me but I could tell it irritated my friends, especially my friend Donna who always told me, “Don’t worry about it” or “It’s not a big deal.” I also was teased about my height. One of my classmates would call me “little girl” and “midget,” which I didn’t like because it was annoying to be treated as if I were 5. I didn’t get much sympathy from my parents either. When I complained to my mother about being short, she would tell me to pray so that God would make me taller. I would say, “Mom, that isn’t going to work.” Her reply was, “You never know, there is such a thing as miracles.” I would sulk more because I believed that God granted miracles only for things that people needed, not what they wanted. My dad kept saying that he was short when he was younger, but because he stretched and did backbends, he grew taller. So my parents forced me to do backbends. My mom would yell at me from downstairs, “Samantha, do your backbends.” I’d hide in my room. She’d get louder and louder and then she’d scream, “SAMANTHAAAA.” Then I’d quickly run downstairs because I knew I’d get in trouble. My dad would hold my back while I bent backward. If I rushed through my backbends or “accidentally” hit my head on the floor so I wouldn’t have to do them again, my mom would bite her lower lip, glare and say “Do it again.” After one of my backbend sessions, I asked my mother, “Mom, why don’t you accept me for who I am?” My mom responded, “I accept you for who you are, but you need to help yourself.” It irritated me that my parents would tell me to accept myself, but they still wanted me to be taller, too. When I got to high school, the teasing felt worse because I knew I wasn’t going to grow anymore. One of the worst times I was teased, we were playing soccer in P.E. and one of my classmates kept taunting me, “Hey, little girl, Hey, little girl.” It pissed me off. I told her “Shut up!” She yelled to the P.E. teacher, “Ms. Murrish, this little girl is yelling at me.” I ignored her but it still hurt because she said it in front of my classmates. HOW TALL? 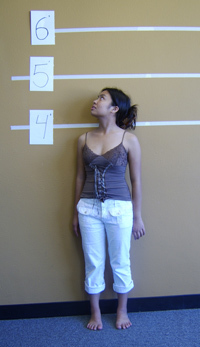 Samantha stands next to tape on the wall to show her height. She’s three inches short of the 5 foot mark. By ninth grade, I had been 4 feet 8 for three years and I was sick of it. I felt I was the only one out of my classmates who wasn’t changing. I would cry in bed because I was frustrated. I told my mother that I wanted to go back to the endocrinologist to see if I could receive the growth hormone. My mom agreed. But the doctor said the same thing—I couldn’t receive the growth hormone because I was already past puberty and my bones had stopped growing. I felt my eyes tearing up but I held it in. I just felt worse because it was final for me. The nurse told me that being short wasn’t so bad, that one of the most important people in the medical field was 4 feet 9. She said something about some woman on the national soccer team being short. But the nurse was 5 feet 4. She had no idea what it was like to be as tiny as me. After that I became obsessive. I surfed the Net for other ways I could grow taller, and explanations for why I was short. I read that people who worried a lot tended to be short and that short people had a hormone deficiency disorder. There were these unbelievable Web sites that claimed people increased their height by taking pills. I remembered my dad watching a television special about people who got their legs lengthened to make them taller. So I typed “leg lengthening” into a search engine. I read that leg lengthening is a painful and long surgery because the bones of both legs are broken in order for pins and wires to be attached. The healing process lasts one to two years. I imagined having the surgery and sitting in a wheelchair with bolts in my legs. It made me hopeful because at least there was a surgery that had some degree of success. I found there was a hospital in Maryland that performed the procedure. A few weeks later I was having one of those days when I was feeling really bad about myself. I printed out the information about the hospital. I whined, “Mom, will you please call the hospital” and gave her the printout. My mom went along and even told me she was going to call. But then she told me to calm down and that being short wasn’t so bad. I eventually calmed down after 15 minutes and realized that it was impossible for me to have the surgery because it cost too much money and my family would have to relocate to Maryland. Later, I felt disappointed that my only chance was out of reach. But other things helped me realize my height wasn’t as bad as I thought. I found a lot of famous short people on a Web site called shortsupport.org. One celebrity who had the same height as me was Édith Piaf, a French singer known for her song “La Vie en Rose” (which means life through rose-colored glasses). I didn’t know who she was but once I listened to her music she became one of my favorite singers. The list of celebrities made me feel better because they were people who concentrated on their talents instead of worrying about their height. After that I went to the site nearly every day because by reading about other short people, I did not feel alone. Thanks to the Web site, I was beginning to accept my height. At the end of sophomore year I was running for class secretary and I had to give a speech. I dropped two phonebooks on the ground and they made a thump. I stood on them and said in a loud voice, “You may know me. I’m the really short girl with the rolling backpack and I want to be your class secretary.” The audience laughed. I didn’t win the election though. Junior year, one of my friends told me, “The only reason people tease you about your height is because you talk about it a lot.” I realized that was true. People did not care. My friends would tell me that it would be odd if I were taller, that I was cute and it wasn’t a big deal. I was fed up worrying about my height. I stopped feeling sorry for myself because I found there were other people in worse situations than I was. At least I was healthy, I had a stable family and friends who loved me for who I was. Plus, I’m a girl and being short is more acceptable for girls than for guys. My relatives still made comments about how I would be prettier if I were taller, but it didn’t bother me because it’s their opinion and I can’t control how they think. I can only control how I react, and I chose to ignore it or make fun of it. Even though I had already accepted my height, I still had to deal with its troubles. During junior year, my 6-foot-2 friend asked me to the homecoming dance. We made an odd couple. When we went to take pictures, the photographer told me stand on a camera case. My date wanted to stand on his knees but the photographer wouldn’t let him because it would look awkward. Standing on the box, I was really happy. Yay, I thought, this is how it feels to be tall! When my date and I slow danced, my face was near his crotch and he had to bend his knees. I looked up one or two times, but strained my neck so instead I turned my head sideways. After five songs, a friend offered to dance one song with my date in exchange that I danced with her 5-foot-4 boyfriend. It was a relief because I wasn’t dancing at his waistline. Later that year, I went to my pediatrician for a checkup and found out I grew from 4 feet 8 3/4 to 4 feet 9. The next day I burst into my journalism class telling everyone “I grew! I grew!” My teacher said, “Finally, Sammi” and laughed. This year I was voted “Most Likely to be Mistaken for a Freshman.” I liked that I won. Sometimes it still bothers me that since I’m short I get labeled “cute.” It feels like they’re saying I’m not as strong emotionally, that I can’t handle that much. I’m still accepting that I’m never going to be taller but now I don’t care what other people think and I focus on my positive qualities. I have a spunky and outgoing personality so that I get noticed. I like to talk to people I don’t know and I’m not afraid to speak my mind. I believe I am a bigger person emotionally than what others physically see. Being short makes me unique. It makes me who I am.